My discovery of backward design came at the right time. I have been slowly making the shift from teaching students about language to teaching students to use language, what we sum up as teaching for proficiency. Backward design allowed me to make a change in what the students understood they had to do. The teacher gives students the objectives formulated as can-do statements. Then shows them how to use language in a series of three tasks that reflect the three modes of communication, Interpretive, Interpersonal and Presentational. 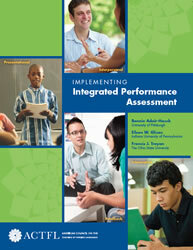 We call this triad, developed by ACTFL, an Integrated Performance Assessment. There were many characteristics of the IPA that worked for my teaching. Principally, it allowed me to use culture as the overarching theme to my unit. Culture is the relationship between the products, practices and perspectives of people. When we show students an authentic document (in an Interpretive task for an IPA) we give them a chance to observe culture and draw conclusions for themselves. I wasn’t doing them any service by making generalizations about French culture myself. It is much better to show them the culture through readings, videos, and pictures. The teacher is in effect bringing the culture into the classroom. On Friday I am going to present on Infusing Culture through Assessment for novice learners at my state’s annual professional development conference. Putting together my presentation gave me time to reflect on where I am in the process of writing and implementing IPAs. I haven’t mastered IPAs, so I am hoping that my audience will appreciate what I have to say about what I have learned so far through the process. The process I have been through has convinced me that IPAs drive a method of instruction that gets learners from the beginning to “use” language and teaches them to speak spontaneously. This method, to me, is worth exploring further. Please see my presentation posted below. Here are my handouts for the presentation.